NASA, The Barrie Colts, Charlie Horse and the "Lucky Charms Planet". - Very Barrie Colts | A website covering the Barrie Colts of the OHL. 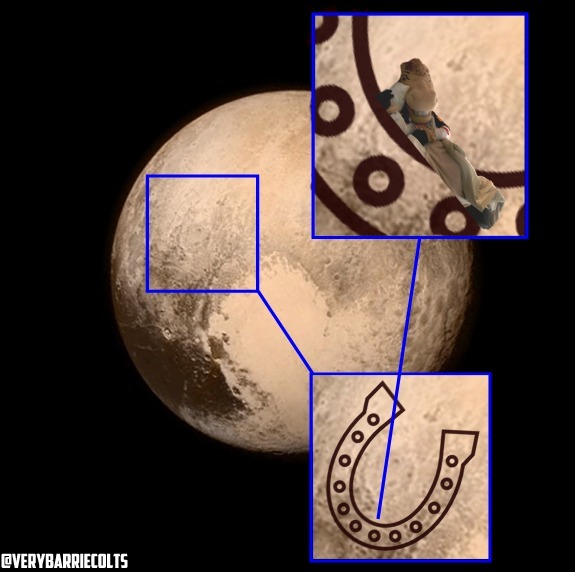 Home Barrie Colts blog Charlie Horse NASA OHL Photoshops planet Pluto NASA, The Barrie Colts, Charlie Horse and the "Lucky Charms Planet". 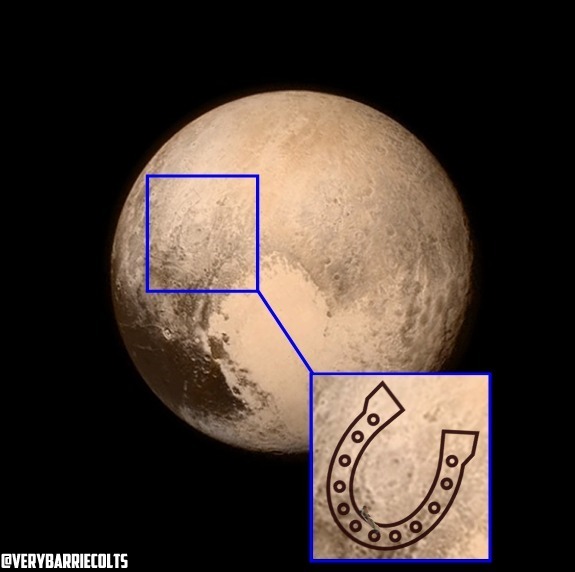 NASA, The Barrie Colts, Charlie Horse and the "Lucky Charms Planet". It has taken 9 years to travel about 3 billion miles (3,000,000,000) but the journey has paid off! Finally, the much anticipated trip to Pluto has resulted in images of the planet that we have never had the chance to visualize! You may be asking yourself, what does this have to do with the Barrie Colts or the OHL? Please, be patient. NASA waited 9 years to get to Pluto so you can wait a few minutes to find out the connection. Though it will be a small wait until we are able to see all the benefits from this journey; even in the early stages we have been lucky enough to see images of the planet. And we are seeing it and understanding it in ways we never imagined possible! Anyways, we have kept you waiting long enough! 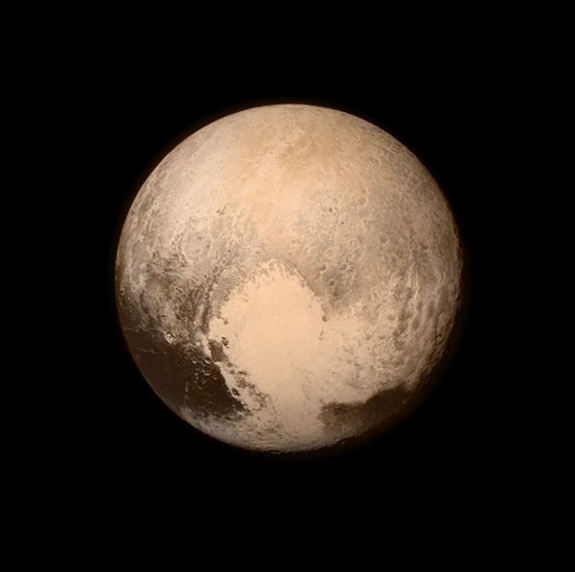 Here is an image of Pluto! Very interesting stuff here. 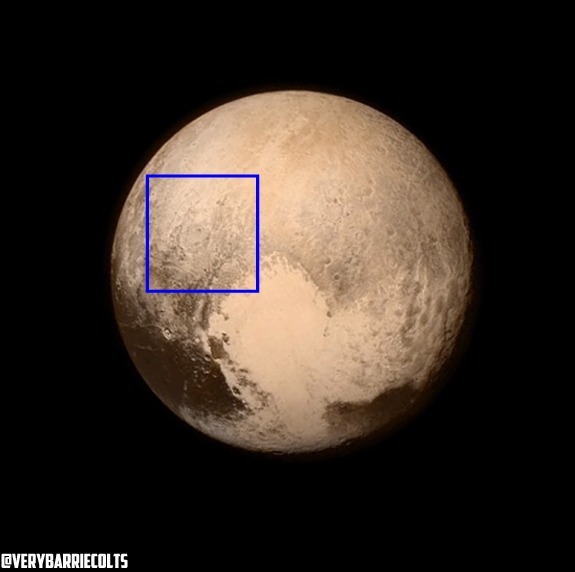 NASA noticed something very intriguing from this image. Just below the "equator" (which has been given the name "the whale") they noticed something that appeared to be a heart shape. For those of you having issues making it out we had our design department put together a quick image to make it more visible. NASA suggests that the 'heart" measures about 2,000 KM (1,200 miles for our American friends) across the surface of Pluto. Very cool stuff! However, when we received the image from our design department, they said while altering the image they noticed something else. There was something just above "the whale" to the left of the "heart". We found it was hard to see what it was they said they saw so we kindly asked them to see if they were able to zoom in on the image so we could have a better understanding of what they saw and what they sent us back blew our minds! INCREDIBLE! We always boast about our graphics people but they went above and beyond on this one. However, the zoom made something else noticeable.. It appeared there was something in the dip of the horseshoe. We felt we were pushing our luck seeing if we could zoom in more (since NASA might not even have these abilities..) with the hopes of getting a clear look at what we thought we saw.. SO THAT IS WHERE CHARLIE HORSE GOES IN THE OFF SEASON! So with this information we have decided that maybe Pluto needs to be renamed. 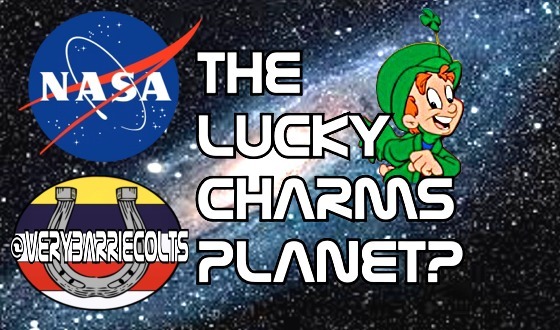 Covered in hearts and horseshoes we feel that "The Lucky Charms" planet might be a more suitable name for the planet!